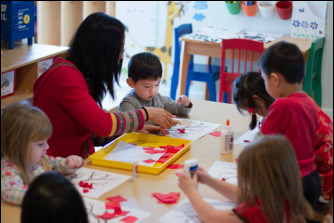 ﻿A&D Stars is a Chinese Dual Immersion Preschool Program that offers a unique and exciting opportunity for young children (ages 2-5) to effortlessly master Mandarin Chinese while obtaining a quality preschool education. Our Mandarin Chinese curriculum is fully integrated into our play-based curriculum, so parents can give their children both in one place. Founded in 2015, A&D Stars provides a safe, loving, play-based learning environment that supports optimal Chinese language learning by tying language to the day-to-day activities across our curriculum. Children naturally acquire a broad vocabulary in Mandarin Chinese while developing social, emotional, physical and cognitive skills. English literacy instruction is also brought to the class for children 3 ½ and up for ten to twenty minutes every day to ensure that children acquire not only strong Mandarin Chinese skills but also the fundamentals of English literacy. Our classroom allows children to engage in an active, hands-on, stimulating learning environment. We use the Maryland state recommended preschool/pre-K curriculum, and consistently adapt it to meet the needs of kids at different levels. Our teachers are enthusiastic, passionate, patient and dedicated to working with young children. All teachers have a college degree and meet MSDE required preschool teacher qualification. Do you want more details or have questions?